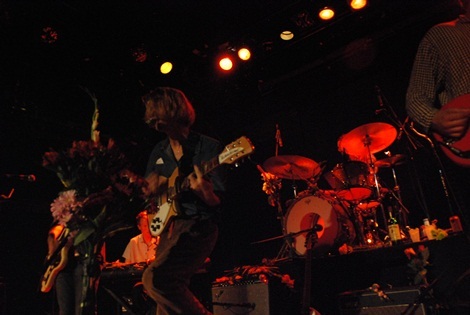 With the stage strewn with flowers, and with his best corduroy pants on, Christopher Owens and Girls set out to prove something at Bowery Ballroom. Prior to this tour Girls was one of those scrappy bands that got by on great songs that didn’t really translate to the stage in any manner that could be described as outstanding.Tonight, however, the tone was quite different. When the drummer/singer from Papa introduced himself as Darren Weiss, I knew we were in for quite the night of music. Not that such name would be particularly important anywhere but Bowery Ballroom on that night, but that night it meant that we were seeing the new drummer for Girls pulling double duty, and this project was pretty serviceable too. While their music is nothing entirely outstanding--think Dr. Dog with a David Bazan vocal--they provided a nice intro and it was great to see Weiss’s talents at the forefront. With one band out of the way I began to wonder how the second opener, Nobunny, would fit into the equation. His snotty brand of punk would have him more fit to share a bill with someone like Hunx and His Punx, than with Girls or Papa, but the crowd enjoyed it all the same. I get the feeling that I witnessed one of the tamer Nobunny shows that’s ever happened, if only because his stage garb didn’t really get put to full use. All the same, it was certainly one of the more curious punk performances I’ve seen and if you get the chance I’d go out and see him. The crowd was patient up until this point, but as the end of his set neared it was obvious that a bit of restlessness was building up. Thankfully, the following set break was short and the men everyone were there to see took to the stage. 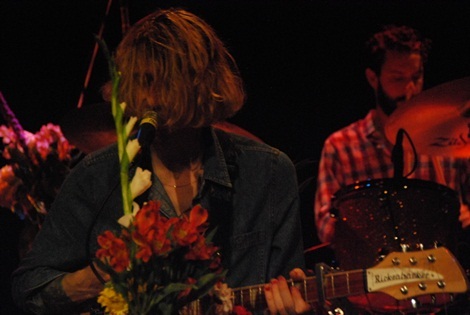 With the stage strewn with flowers, and with his best corduroy pants on, Christopher Owens set out to prove something at Bowery Ballroom. 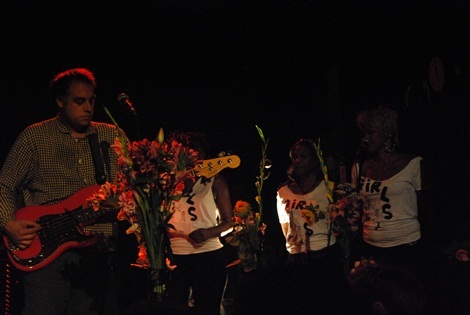 Prior to this tour Girls was one of those scrappy bands that got by on great songs that didn’t really translate to the stage in any manner that could be described as outstanding. On previous live outings, sure, they were loud, but that was really the only factor that distinguished these outings from studio efforts. Tonight, however, the tone was quite different. Owens took to the stage with the confidence of a new band backing him and a three piece set of backing vocalists. This time, Girls meant business, and their set proved it. From the opener 'Honey Bunny' a new professionalism was evident in the way that they went about their business. Owens, still not much of a talker between songs, seemed much more expressive behind the microphone, allowing for that personal connection with the crowd in ways unforeseen to a frontman not prone to mindless stage banter. This continued throughout the set, Owens seemed legitimately heartbroken in old staples like 'Laura', a song which seemed tamed and restrained due to Owens stage presence in previous live performances. However, tonight was about Father, Son, Holy Ghost and it was the songs from that album that really shined. Sure 'Lust For Life' was as great as it always is, but even lesser numbers from the new album like 'Magic' or 'Love Like A River' really shined in the live setting. He was some sort of preacher, slowly, emotionally proselytizing to his enraptured flock. We felt the pain in the painful numbers, and the wistfulness that accompanies songs like 'Substance'. And that’s not even mentioning the Black Sabbath-esque 'Die' which, correct me if I’m wrong, might have provided the first ever moshpit at a Girls show. It really was one of the more emotional shows I have ever seen, and this is all before the two encores, which proved to be two of the most moving moments of the night. 'Hellhole Ratrace' was notable not only for its singalong capabilities, but the new backing band transformed the song from what was once a great song into something transcendent. Weiss’s drumming in the bridge really just set the song off, and those vocal harmonies from the new background singers were some sort of heavenly mixture of Motown and Dirty Projectors. After yet another short break, Owens and Co. returned to the stage for a final number: the title track from last year’s Broken Dreams Club. What was once a decrying of the desolation and the downfall of our world in the midst of personal struggles became somewhat of an anthem for everyone there. I’m not sure if the connection was made but it made sense to me. It was such a communal event because deep down we all like to think we’re a little messed up on the inside and sometimes any outside events start to feel like too much. Well at that moment, none of that mattered. The crowd was a sea of smiles, and I swear I saw one on Owens’ face too as he left the stage.